One of the saddest things to commonly occur on Manitoba roadways is collision with wildlife. In Manitoba alone, there are about 11,000 crashes each year involving animals. Collision with animals can cause severe damage to the vehicle and may also cause injury to the occupants. It all depends on the vehicle’s speed and type of vehicle. Collisions can occur anytime, but there are peak times when they are most likely. 40% of collisions occur between 7:00 pm and midnight. 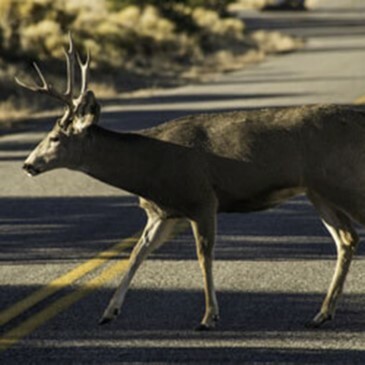 Most of all wildlife collisions involve deer and the high-risk time times are May, October and November. Bear collisions peak in September and October as bears forage closer to communities. December and January are the high-risk times for moose collisions. Even with precaution, animals can be impossible to avoid when they suddenly dart out from the side of the road (tall weeds, ditches, forested areas or fields are popular spots for wildlife). If possible, move the vehicle to a safe place. Pull off the road, turn on the hazard lights and Illuminate the animal with the head lights. Call 911 if anyone is injured & make a police report for any damages. If the animal is injured, blocking traffic or is creating a hazard for other drivers call the local police or RCMP. DO NOT approach the animal, especially if wounded. A frightened, wounded deer or moose may panic and cause harm. If safe to leave the car inspect the vehicle and look for leaking fluid, loose parts, tire damage, or broken lights. If the vehicle seems unsafe to drive, call for a tow truck. Photos are extremely important to substantiate for insurance that the vehicle’s damage is the result of a collision with wildlife and not another object. Only if safe to do so, take pictures of any vehicle damage, the road, surroundings, the animal, as well as any visible injuries to occupants. Check the bumper and other areas of impact and look for cracks that may have pinched small strands of hair from the animal. Photograph this up close. Call MPI to report the collision and take it to an experienced DirectRepair autobody as soon as reasonably possible for a damage estimate. Collision with wildlife carries a zero-dollar deductible in Manitoba if you have a $100, $200 or $300 deductible. If you have a $500 deductible, the deductible applies. There is no penalty against one’s driver’s license for collisions with wildlife. DO NOT wash the vehicle as the estimator will be looking for indications to support the insurance claim for wildlife. Not all damage is obvious and secondary damage away from the primary point of impact is possible. Shifted panels, soft damage without scratches or gouges, or damage to the undercarriage are examples of secondary damage that experienced Autobody Estimators look for and ensure are included in your insurance claim.